Sorry for the delay with the blog posts lately guys, you know, a lot of work goes into organising a banger rally, especially when we are planning on making this years rally the best one yet! But we’ve put a little piece together on one of the highlights of the 2010 Motoscape Rally, a place I’m sure most of you will never have been before, Bled in Slovenia. This town is an absolute gem and must be one of the most beautiful places in Europe. Bled is a lakeside town in Slovenia which is surrounded by the spectacular Julian Alps and those on the Push on to Prague rally will see for themselves why it is known as the hidden paradise. The scenery makes it an ideal walking / cycling haven or just a fantastic place to relax and take in the scenery. If there are any runners out there, it’s definitely worth bringing your running gear and running round the lake. Another amazing thing to do whilst in Slovenia visiting the unbelievable underground Caves of Postojna, which is over 4 miles and is accessed by a special underground electric train. 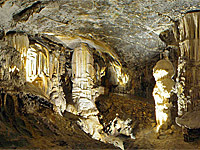 The caves boast the very best examples of stalactites and stalagmites any where in the world and is well worth the visit. In the evenings there are plenty of bars and restaurants, many of which look over Lake Bled which is illuminated by the night. Visiting places like Bled is what makes the Motoscape Rally a journey like no other, I can’t think of another trip where one day you’re bolting round the Nurburgring like the Stig, then another day you’re chilling out with a cold beer staring across the awe-inspiring Lake Bled! If any of you have been to Bled before, let us know your thoughts in the comments section below!